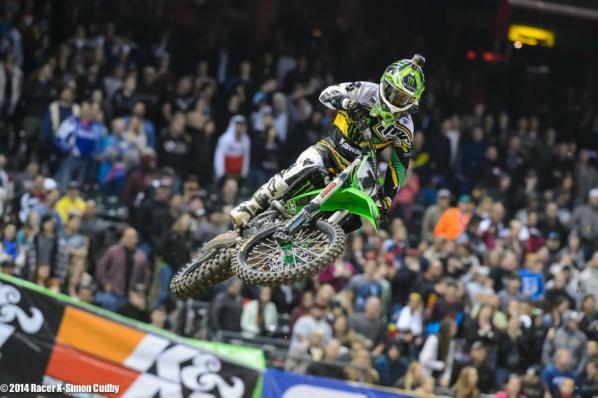 In front of 49,834 fans inside Chase Field, reigning three-time 450SX Class Champion Ryan Villopoto won his first Monster Energy AMA Supercross, an FIM World Championship, race of the season aboard his Monster Energy Kawasaki. Yoshimura Suzuki’s Australian import Matt Moss grabbed the Nuclear Cowboyz® Holeshot Award to start the 20-lap 450SX Class Main Event, with Toyota/Yamaha/N-Fab/JGRMX’s Justin Brayton and Red Bull KTM’s Ryan Dungey in tow. Villopoto started in ninth, behind the likes of Yoshimura Suzuki’s James Stewart, Team Honda Muscle Milk’s Justin Barcia, and Red Bull KTM’s Ken Roczen. Brayton took over the lead after the second corner, bringing Dungey and Barcia with him. Barcia surged towards the front, passing Dungey for second and then setting his sights on the lead. 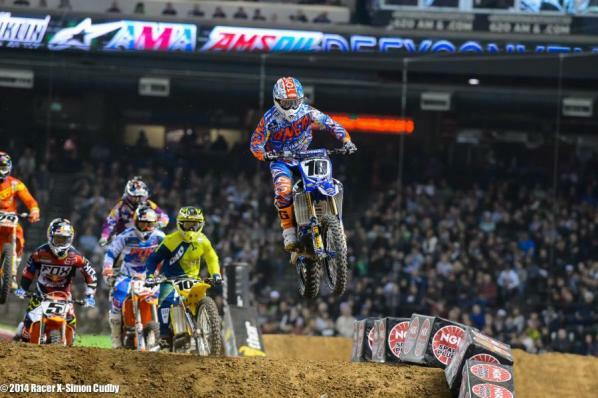 Barcia briefly passed Brayton, but the Yamaha rider countered back, which allowed Dungey to reclaim second from Barcia. A six-rider battle ensued with Brayton, Dungey, Roczen, Barcia, Villopoto, and Stewart all within just a few seconds of one another. On Lap 7, Barcia and Roczen made contact while battling for third, sending Roczen to the ground. Villopoto pressured Barcia shortly thereafter and made the pass for third. As Dungey looked to make a move on Brayton, Villopoto closed in and made the pass for second on Lap 11. On Lap 13, Villopoto passed Brayton and fended off a late charge to win in Phoenix for the first time in the 450SX Class. 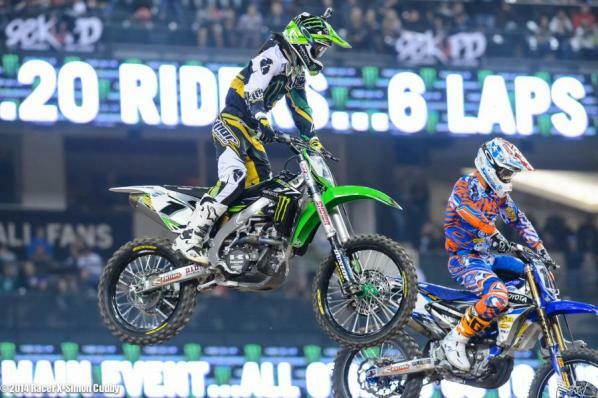 “Justin was riding a hell of a race,” said Villopoto. “I have to give it to him, he made it tough. I didn’t get the start I wanted because the (starting) gate was slippery, but I just needed to be patient. "The Phoenix (track) gets really slick so I had to take my time and make sure my passes stuck," he added. Brayton’s runner-up effort tied his career-best finish, which came in Toronto in 2012. “This feels so good,” Brayton exclaimed. “The new Yamaha is unbelievable. We did our homework this year. It’s been a lot of hard work, but being up [on the podium] pays off. 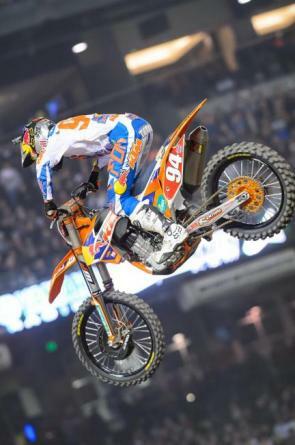 Dungey finished third, giving him back-to-back podium results. 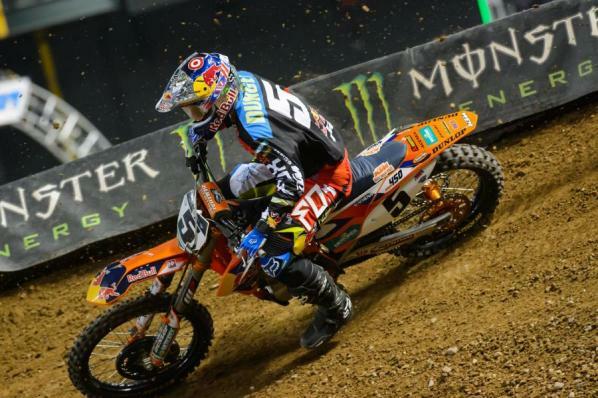 “That was a good opportunity to get a win,” said Dungey. “I kept making mistakes. I couldn’t get through the whoops, but all in all it was a good ride. With his win, the 35th of his career, Villopoto moves into the 450SX Class points lead. 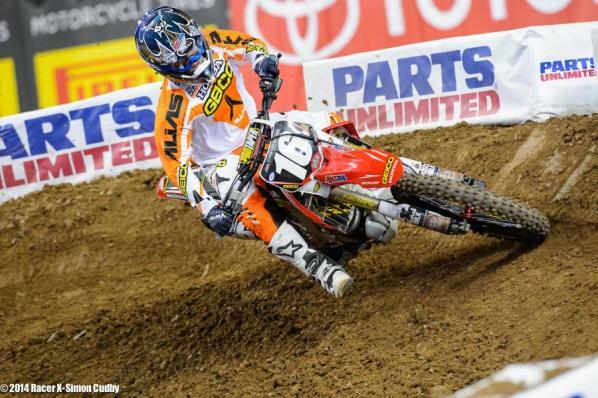 He holds a one-point advantage over Dungey. Australia's Chad Reed had a difficult night aboard his Discount Tyres Kawasaki KX450F, working his way to a ninth place finish after a bat start left him burried in the field. Matt Moss slowly slipped back through the field but held on for a great 11th place finish in just his second outing and in the process bettered his 13th place result from last weekend in A1. Moss was also able to post the 8th fastest lap time in the main event. The third Australian 450SX class rider, Lawson Bopping aboard his privateer Suzuki looked as though he was going to make it through to the nights main event early on in his Semi final race when he passed Moss for the lead. Unfortunatley for Bopping a mid race crash put him out of contention and into the LCQ where he suffered a bad start putting and end to his first AMA Supercross race. For the second consecutive week, Rockstar Energy Racing’s Jason Anderson used a last-lap pass to post back-to-back victories in the Western Regional 250SX Class Championship. MyPlash/Metal Mulisha/Star Racing Yamaha’s Cooper Webb raced to the Nuclear Cowboyz Holeshot Award to start the Western Regional 250SX Class Main Event. Webb held onto the lead for most of the opening lap until Troy Lee Designs/Lucas Oil Honda’s Cole Seely moved into the lead by passing both Webb and Anderson, who started in second. Webb went down moments later and lost several positions. 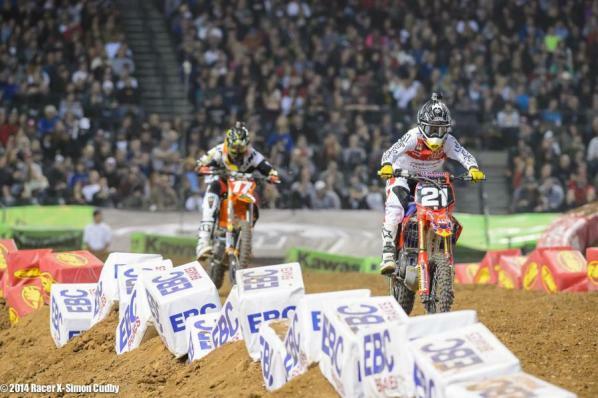 Seely and Anderson opened a comfortable lead on the field, with Seely extending his advantage over Anderson for most of the 15-lap Main Event. As the leaders approached lappers in the late stages, Anderson reduced his deficit to mere bike lengths. On the final lap, Seely made a slight mistake, which allowed Anderson to challenge for the lead, making the pass with about a half lap remaining. “I was out for redemption tonight,” said Anderson, who failed to qualify for the Main Event in Phoenix the year prior. “I got a good start on my KTM, like I have been all season. I don’t plan on those last-lap passes, but it was there and I needed to take it. My goal is to keep control of the red number plate so I’ll do whatever it takes to do that. "I really want it," he concluded. For Seely it was the second weekend in a row where he was left feeling bummed after the race. GEICO Honda’s Zach Osborne and Monster Energy/Pro Circuit/Kawasaki’s Dean Wilson battled for the third position for the bulk of the Main Event, with Osborne eventually getting the edge to grab his second podium finish of the year. With Anderson, Seely, and Osborne on the podium, it duplicated the finishing order from last week’s opening race. Anderson’s lead in the championship sits at six points. Australia's representative in the 250SX West class, Red Bull KTM's Dean Ferris got the night off to a rough start when he crashed in the first turn of his heat race leaving him on the ground and at the back of the field. Never one to give up, Ferris put on a charge in just his second ever AMA Supercross event and was able to make a pass for the final qualifying spot directly out of the head on the last lap. Ferris started just outside the top ten when the field rounded the first turn in the main event and rode 15 consistent laps taking advantage of competitors mistakes to finish with a great 7th place finish and in doing so lifted himself to 10th place in the championship standings. 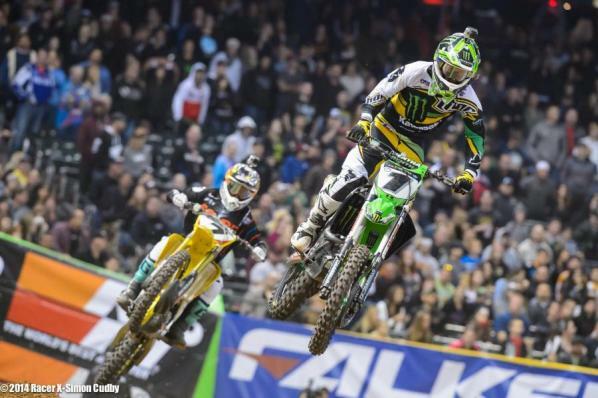 Monster Energy Supercross returns to Anaheim and Angel Stadium for the third race of the 2014 season next weekend the 18th of January. The live will once again be aired live in Australian on ESPN on the Foxtel Network starting at 2.30pm AEDT. A2 will also see the series celebrate the 40th Anniversary of the championship with a throw back to the 80's theme. 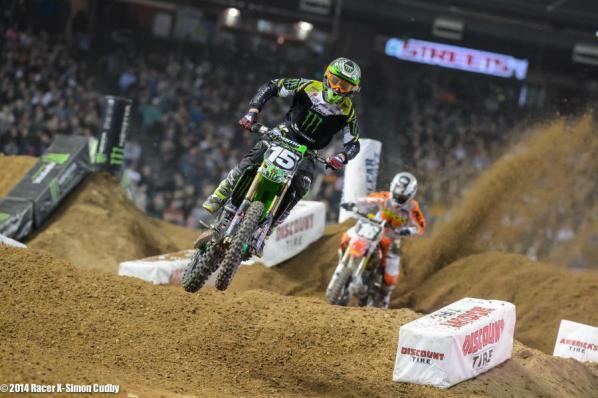 The results from round two of Monster Energy Supercross from Phoenix could look predictable in a way, since Ryan Villopoto completely and totally reminded the field that he's the boss of this sport. 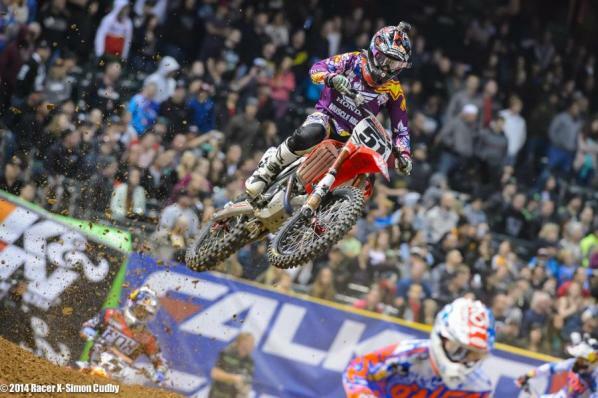 And Jason Anderson again used a last-lap pass to steal the 250SX West win from Cole Seely. But beneath all that laid a pair of nail-biting main events that still leave some heads scratching as we head back to California for round three next weekend. Here's how it looked from the desert tonight. Here's your first surprise--Justin Brayton (10) wrestles the early lead away from Matt Moss (102 in the yellow and blue gear) and immediately starts opening a gap. The KTM riders Ryan Dungey and Ken Roczen were there, but a ton of favorites were way back. The mid-pack guys included Villopoto and James Stewart. RV was about tenth early and slowly went to work, taking the measure of Stewart as he came through. For a moment, early, Justin Barcia looked like the man to beat, and he sliced up to second and started working on Brayton. Then, suddenly, the Muscle Milk Honda rider started making mistakes and going backwards. Once Barcia dropped back it was Red Bull KTM rider Dungey's turn to take second and make a run at Brayton. But the JGR/Toyota Yamaha rider up front wasn't giving up any ground. ...last week's winner, Ken Roczen. 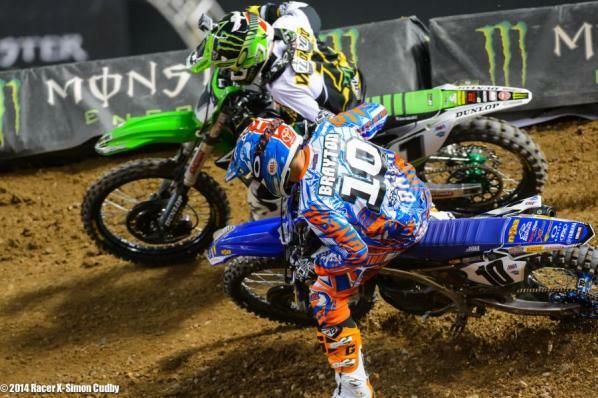 Kenny went down and said he'll be looking for revenge on Barcia soon. He finished sixth. Showing no mercy once up to speed, Villopoto passed Dungey for second and then went after Brayton. ...Brayton had impressive whoop speed and was able to show RV a wheel. Villopoto pulled a small gap but made a mistake late, letting Brayton close right back to him on the last lap. He pulled alongside the champ in the whoops and showed him a wheel again with a half lap to go! Villopoto took the win on his Monster Energy Kawasaki, Brayton was second. Dungey got held up by a lapper and couldn't triple a rhythm lane with three laps to go, and couldn't quite climb back into the battle. He finished third. 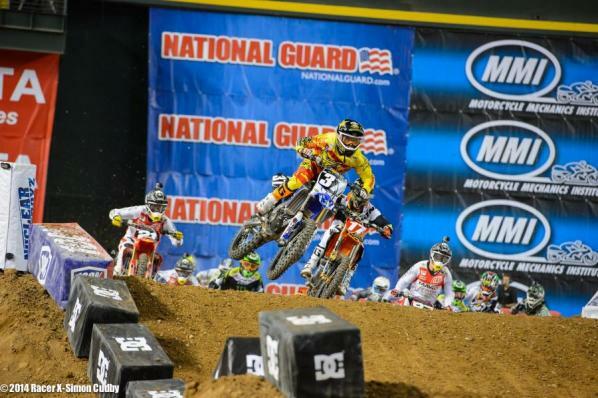 In the 250s, Yamalube Star Yamaha rider Cooper Webb snagged the holie. But notice Anderson (17) and Seely (21) right there ready to battle. Once again, Lucas Oil/TLD Honda's Seely got around Anderson and Anderson gave chase while they pulled away from the field. It was exactly like Anaheim 1. Dean Wilson was fourth early behind Shane McElrath but made some mistakes trying to make the pass. 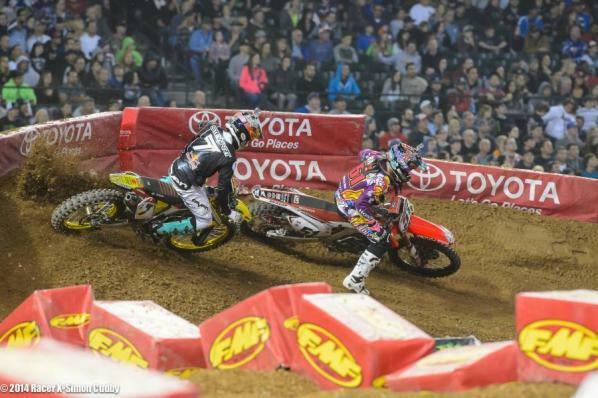 Soon, Anderson and Seely got away. Then McElrath got run into by Webb, resulting in both riders hitting the ground. Zach Osborne (16) got past them to give chase to Wilson for third. Incredibly, on the last lap Anderson again struck on Seely, finding a better line, getting to the inside and making the pass--it wasn't quite as aggressive as last week's Anaheim move, but it got the job done. 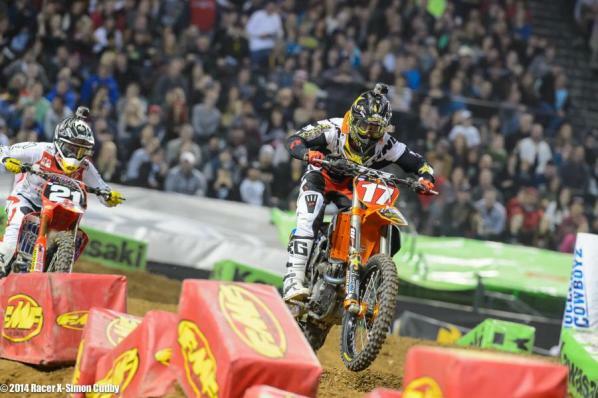 Anderson has back-to-back wins to open the season on his Rockstar KTM. Another solid run by Osborne on the GEICO Honda, who got around Wilson for third.